Your typical bear hunting day will begin with a hearty mid morning breakfast at camp. After that you will have some time in the day to relax, take in some of the local scenery, or even try a little fishing if you are so inclined. Mid afternoon you will have dinner before packing up to head to your stand for the evening. Following that your guide will drive you by truck to the nearest point to access your pre-baited stand location. From there you and your guide will quad in to access your secluded stand location where he will ensure you are all set for your late afternoon/evening hunt. On a normal evening you will watch bears come and go from your bait site, anxiously awaiting the big bruiser you have been dreaming of. Many of our stand locations now have cellular service so you are able to contact your guide should you tag out early. Otherwise your guide will be there to pick you up shortly after legal shooting time is up. After that it’s back to camp for a late night snack before hitting the hay to rest up for your next adventure filled day of Saskatchewan bear hunting. Interested in fishing while here on your bear hunt? There are options for shore fishing trips close to camp. 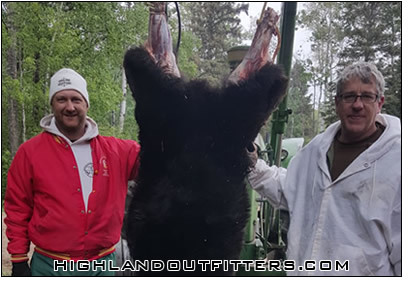 We don’t include guided fishing trips as part of our bear hunting package, but we will certainly ensure you get on the safest route to whatever local fishing hole you choose. Options range from a river with brook trout a mile from camp, or a stocked rainbow trout pond a few miles out, or lakes filled with walleye and pike further away. If fishing on your own is of interest to you, then you want to rent a vehicle for the week when you arrive in Saskatoon. Given that the bear hunting takes place late in the day, mornings can give you the time to strike off on your own fishing. Fishing on your own is also a great option for your remaining days at camp after you fill your bear tag. Renting a car also gives you the ability to leave camp early should you tag out early and wish to fly home from Saskatoon sooner.